At surface level, the story is entertaining. At another level, it’s visionary and mythic. The book takes place in the Everglades and at times seems mucky and absurd with all the gator show stuff. Then again, after some reading patience, we see that the setting is transcendent, almost like a surreal Macondo village for one small family. At times the environment is genuinely fearsome, a primordial, superstitious land, a veritable hell-hole haunted by the horrors of Indian history and misguided development. Russell knows her writing and her novel places us in various levels of reader reaction. It’s a book with well thought-out structure and theme. Various chapters were short stories brought to a united whole. She can cut a phrase and put forth detailed images that nail a setting and create a mood. They are almost too good, the visual details. One wonders, how long (in a cynical, nihilistic, often numb reader nation, and in terms of literary modes and fickleness for “what works”and what is durable for artistic perpetuity) can such a delicate level of imagistic writing remain as paragon? Russell brings us along, making the many digressions interesting, and meanwhile subtly getting us to care about the Bigtree family circle. Then we get into Ossie’s call of the sexual wild and Kiwi’s dire employment at an apocalyptic theme park. When Kiwi leaves home, the chapters alternate between Ava’s 1st person narrative and third person limited for Kiwi. It’s not orthodox, but it works. At one point less than half in, I was dismayed and about to set the whole damn business aside for later. But then came the growing mystery of the dredging boat and Louis and Ossie’s disappearance…then the author brings in a larger than life character, the mystical Bird Man who with his quiet voice of accommodation becomes Ava’s apparent hero (though he’s far from it). They go on a supposed quest to find the wayward sister and head for a remote area in the marsh called the Underground. Along the way, Ava is confronted by reality versus illusion. Is It Real or Not? Is it Paradise or a Land of Buzzards? Can someone like Mama Weeds really exist out there? In dramatic parallel we get alternating chapters depicting Kiwi’s misadventures at a macabre theme park over on “the Mainland,” where life is anathema to the Bigtrees. As he works his way up the employment chain from park maintenance to lifeguard (and hero) and eventually seaplane pilot (again a hero), we realize the coming convergence of the two storylines. All’s well that ends well. Their native home and its sustaining Alligator Wrestling Show does not survive “Carnival Darwinism.” Mainland life wins in the end. The sisters leave their aboriginal culture and have to march in line with the rest of the Mainlanders, wearing uniforms at school with white girls. It’s tricky to tell where this story is located. Best I can tell, it’s fictionalized to the point where there’s no need to say, but real geographic names and areas (rivers) and landmarks (I-95?) both far and near are mentioned. The swamp seems to range anywhere between Punta Gorda and Flamingo ( a lot of miles). 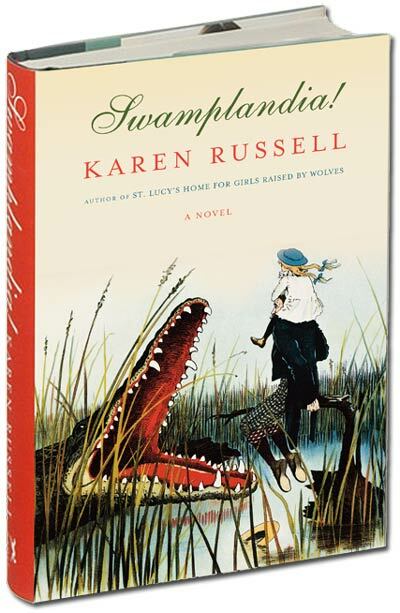 Posted in booknotes and tagged review Karen Russell on July 7, 2014 by Wm P.